Isabelle Pouliot is a journalist as well as a translator, and a copy of her article on French-American linguist Léon Dostert is featured in this issue. We took the opportunity to meet with the author to learn about her dual career. Intermediate and advanced Trados Studio users gained valuable insights into the nooks and crannies of this CAT tool in the workshop by Tuomas Kostiainen. Seasoned interpreter Angela Zawadzki provides insight into the challenges of interpreting into one’s B language. If you Google Aaron Koblin, you’ll get a lot of information on the Creative Director of the Data Arts Team at — yes — Google itself, including the following quote: “They say an elephant never forgets. Well, you are not an elephant. Take notes, constantly.” Easier said than done, perhaps. Leon Dostert (1904-1971) played a major role in the early development of simultaneous interpreting. This interpreting mode, which seems so commonplace today, made its actual debut during the Nuremburg trials of 1945-46. Dostert led the team of court interpreters at Nuremberg, and it was he who convinced US prosecutor Robert Jackson to employ simultaneous interpreting instead of consecutive, using a microphone-and-headset system. “Drought” is a multi-purpose word. As Californians the word currently triggers powerful reactions as we suffer through this amazing State’s longest and most devastating drought in history. So in this case, the word refers to a “prolonged period of abnormally low rainfall.” But when the word is applied to a small, home-based business – such as the professional translator – “drought” refers to a “prolonged absence of income-producing business,” and this is disturbing. Our journey began with a delayed flight. We made it in time for the Welcome Reception, but rushing to get there would be just a prelude to the fast-paced days to follow. Dr. Spence Green from Stanford University shared research findings on human and machine translation collaboration and presented his own web-based mixedinitiative translation application. Author Beth Carey and translator Fred Schodt recount their Collaboration on a two-volume biography of filmmaker Hayao Miyazaki. Accomplished translator, musician, and cyclist Michael Schubert let us in for a backstage peek into his background and work. 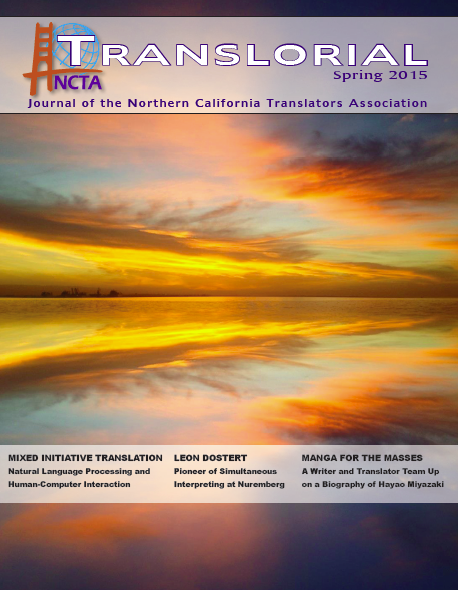 translorial posted this article under ATA, Conferences, Interpretation, NCTA Events, NCTA Meetings, Worthy of a Visit	on Friday, May 1st, 2015 at 3:30 am	You can follow any responses to this entry through the RSS 2.0 feed. Both comments and pings are currently closed.